Cuerito is pig skin (pork rind) from Mexican cuisine, Venezuelan cuisine and Spanish cuisine. Cuero is the Spanish language word for leather or hide, so cueritos means "little leathers". They are usually pickled in vinegar (cueritos de vinagre) and can be made with a spicy sauce. The vinegar can be seasoned with pineapple, dulce macho (piloncillo), cloves, peppercorns, chile de arbol and oregano. There are also family recipes. Cueritos are used to make a type of cemita and can be used in other dishes like tostadas. Cueritos are sometimes served in a glass with strips of the pickled pork rind alongside a slaw of cabbage, cucumber, lime, and chile sauce. The Mexican street food (antojito) known as "tostilocos" are made by slicing nacho-flavored tostito chips vertically and topping them with cucumber, cueritos, lime juice, Valentina hot sauce, chamoy, tajín (seasoning) chile powder, salt and "Japanese peanuts" (peanuts encased in a crunchy brown flour shell). In Acatlán, Hidalgo the feast in honor of the Archangel Michael is held from the 20-29 of September, with religious events, traditional dances and traditional foods such as cueritos made with chili pepper sauce and varieties of pulque. Pickling differentiates cueritos from chicharron, which is fried pork skin. In Spain the chicharrón is the rind with fat still attached and cuerito is a rind with no fat attached. In Mexico, chicharron is the cuerito or pig skin fried to a crisp like cracklings in the southern states and cueritos is soft, deep fat fried pig skin, chopped and used for tacos. In Mexico, natural, un-cured cueritos, usually the thick pig skin without the fat attached, are always combined with "macisa", solid or thick meat, in "carnitas" which is deep fat fried pig parts sold for tacos. The tacos are served with a choice of meats, chopped, in 1 or 2 soft corn tortillas, covered with chopped cilantro and onion, and the choice of a hot "chili" sauce in every public market, most "carnicerias", meat stores, or many restaurants or other places that serve "tacos", the Mexican equivalent of hot dogs or hamburgers. Cuerito Grueso is thick pigskin from the pig ears, face and feet. Cuerito Delgado is from the pig's body and is thinner. Encurtidos are pickled vegetables, peanuts and potatoes. Other subtleties of the varieties of epidermis and pig fat have also been noted. 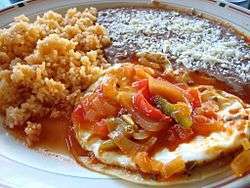 ↑ "Mexican Food: Chicharrón with Cueritos". Mexicanfoods.blogspot.com. 2004-02-23. Retrieved 2013-07-19. ↑ Bob Mrotek (2009-10-21). "Mexico Bob: Tostadas de Cueritos de Carmelita". Mexicobob.blogspot.com. Retrieved 2013-07-19.